It's that time of year again! Time for holiday shopping and parties! Come out and see me and tons of other fabulous Cleveland artists at the MADE in the 216 Holiday shop! The kick off party is this Friday and here's the scoop from the one and only Jennie Doran, shop owner extraordinaire! 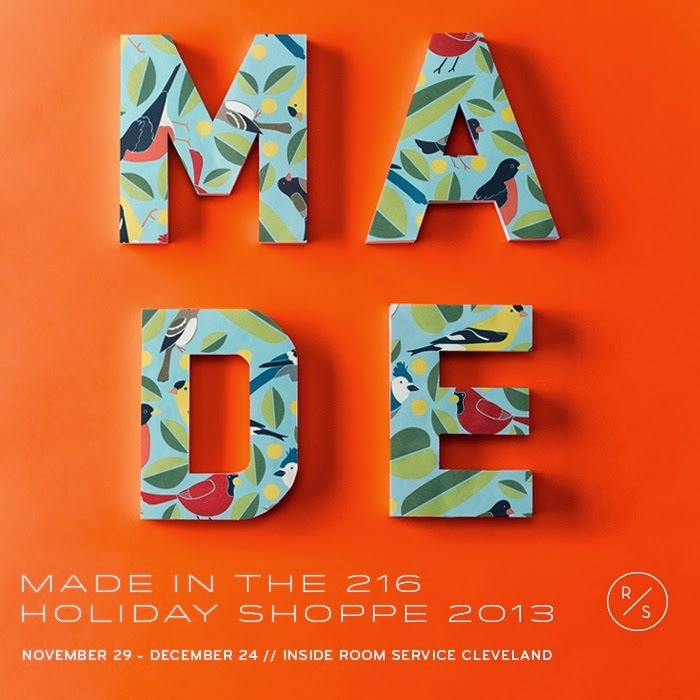 Join us this holiday season as we celebrate great design and the Cleveland artisans that make it happen at R/S's annual MADE IN THE 216 HOLIDAY SHOPPE!! There is tons to do in our fabulous Ohio City neighborhood, and MADE is right in the thick of it! We've got THE gifts for everyone on that list, and we are open 7 days a week, 11-6!! Located inside Room Service at 2078 W. 25th St.
Do be sure to join us for our OPENING NIGHT PARTY shenanigans on "Black Friday" NOVEMBER 29th at 4pm. Our favorite DJ Peter Pleasurecruise is on the tunes, and we'll have very own MADE brew on tap, wine and hot toddy's! Scrumptious treats provided by the fabulous Becca Ritterspach of the newly launched Save Room!! Afterparty goes down at The DUCK ISLAND CLUB, just a skip from R/S at 2102 Freeman Ave in Tremont. Don't miss it friends!!! Love Local. Shop MADE.